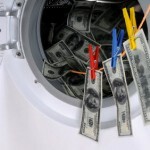 Money Laundering: Who Has Dirty Money? • Lack of intent to commit the crime. People who handle money — accountants, bankers, etc. — can be involved unknowingly in any stage of the money laundering process. The defense needs only to prove that the accused was unaware that the money involved was from illegal sources. • Duress or Intimidation. A defendant who believes that some harm may come to his or her person or family by refusing to participate in the crime of money laundering can plead not guilty to money laundering. • Lack of or insufficient evidence. To be convicted of money laundering, the prosecution must prove that the defendant intended to cover up the source of the illegal funds. Also, the prosecution must prove that the laundered funds came from some illegal activity.